This SK-5 high carbon steel fixed blade from Boker of Germany matches one of my favorite survival knife designs. Recreating a style commissioned by General Curtis Lemay of the Strategic Air Command, this knife competed successfully against models from Randall's Tree brand and for years was the standard pilot's issue blade. Only 8-3/8 inches long, the knife's slim 4-1/2-inch blade makes it an excellent outdoorsman's knife today, strong enough to survive rough work but slender enough to fillet fish. Stacked leather discs on a rat tail tang form the weatherproof handle grip, capped by a polished nickel silver pommel with lanyard hole. Spacers of both aluminum and brass add some aesthetic value as well as a simple choil finger guard. Meeting one of the critical Air Force design standards with its surprisingly light weight, this knife's 3.6 ounces was the main reason it beat the competition from Randall. Today, that puts the Pilot Survival Knife in the ultra-light category without losing full-sized strength. 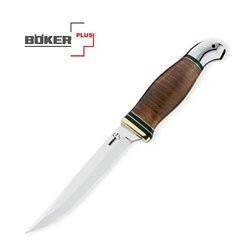 The high polish and refined look of this Boker knife may surprise anyone who expects a military survival knife to be crude. The Ka-Bar from that same era became well known for being as much pry bar and hammer as it was a cutting tool, but the Boker Air Force version of the survival knife had lighter applications in mind. For today's sportsmen, it's a great blade featuring some of the same rugged construction as the coarser Ka-Bar, but more efficient for many camp uses. The Boker Air Force Pilot Survival Knife does a better job of cleaning fish; but if you want to punch holes in steel barrels, choose the Marine Ka-Bar.